We hear The Beaver Whispers! OH, NO! They've lost it--call the shrinks. Well, it's true. This is always a wonderful time of year when our Dear Neighbor, Beaver Creek comes alive with snowmelt runoff. Technically, it's Wet Beaver Creek but nobody calls it Wet Beaver except for the US Geological Survey. There's also Dry Beaver Creek not far away. Wet Beaver is a year-round perennial stream. Dry Beaver is, well...d-r-y....except during runoff season. Wet and Dry mix their molecules at McGuireville (Home of The Goat Ropers) and then they officially become Beaver Creek. However, Everybody around here, far and wide, calls the stream in front of 2nd Chance Ranch simply Beaver Creek. You would be truly weird if you called it Wet Beaver Creek. Only the gubmint geeks do that. Well, Beaver Creeks talks to us when it begins to run higher. Its baseflow can't be heard unless you are standing on the streambank. At some point, water flowing over those big basalt cobbles in the stream channel begins to make enough noise to be heard here INSIDE the straw house. Beaver has many voices. We've heard it roar back during the El Nino floods. We could actually hear the crash and boom of boulders being thrashed about by the water. Most of the time, Beaver simply whispers. Once in awhile it begins to rumble. It's roaring voices are rare. Local people love it when Beaver Creek Speaks. Everyone asks each other, "Have you heard the creek?" Even deaf ol' Little Yonni can hear Beaver Creek Speak. After many years tuning our ears to "Beaver Speak," we can pretty well tell ya what kind of flow it's carrying. Beaver speaks the loudest in the middle of the night. That's when the previous day's snow melt reaches this far downstream. The water recedes back to a whisper during the late afternoon and then begins to gain in volume right about campfire time. By the wee hours of the following day, we can hear it through the thick walls of the straw house. When Beaver is really cranking, it can actually wake us from a deep sleep. It's a wonderful time of year when Beaver Creek Speaks. We love it. 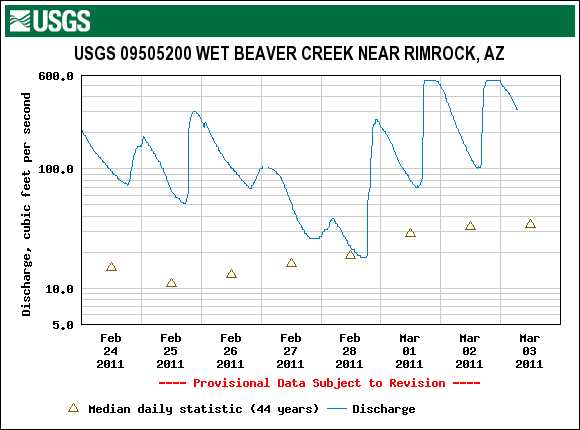 Here is today's USGS hydrograph. If this warm spell continues (it was 74 here yesterday) Beaver might speak a wee bit louder in the nights ahead. Campfires are near perfect when the Beaver is talking to us from across the Old Field. I see WB's cousin Dry has a fair bit of liquid in it too. Oak Creek has been whispering to me at night over here as well. Spring is nigh....and there was much rejoicing. Steve says our snow will likely be all gone by tomorrow. It's melting fast.